An eco-friendly, modern way to celebrate an event, loved one, or family with a tree and plaque in our park near Saskatoon, SK. Treeternity allows you to celebrate or remember an important person or aspect of your life in an environmentally positive way. A walk through Treeternity Memorial Forest in the future will be a journey of all walks of life, every memory is equally welcome. Each tree has its own story so there are countless reasons why planting a tree may be something you want to do. You can also offer it as a unique gift for someone you love, they are a perfect example of something that gives more than once. 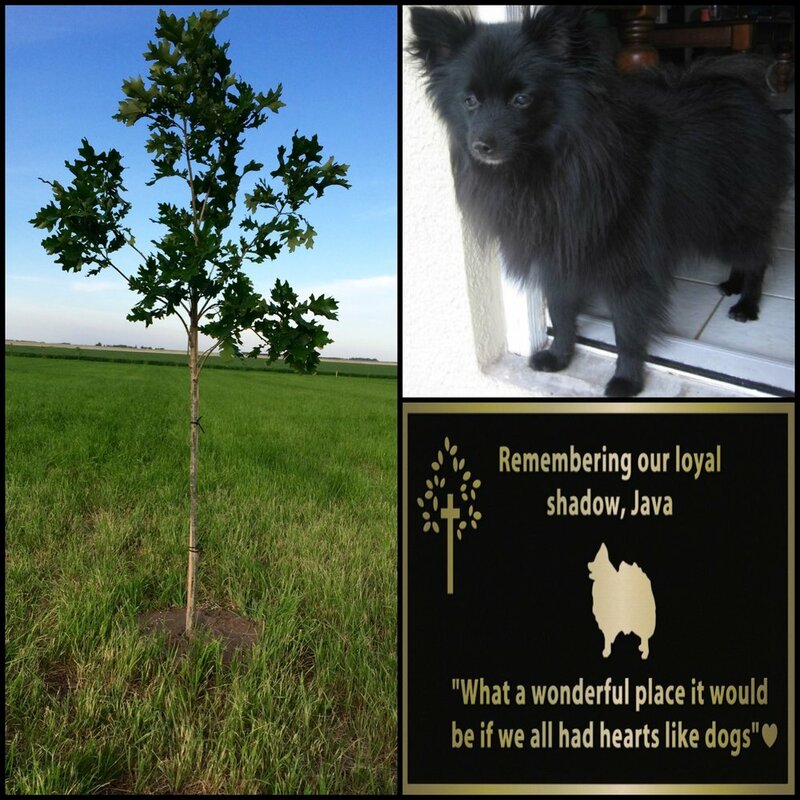 We are happy to coordinate a special gift for your loss in the form of a Treeternity Memorial tree and plaque. Each memorial allows your loved one to give back to our planet through the circle of life. Contact us to set up a button for you free of charge. We are honoured and proud to have been a part of a tree planting ceremony for Saskatchewan's fallen Police and Peace Officers this past year. A Treeternity Memorial Forest memorial includes a tree (approx 3 years old), which will be planted on a 12’x12’ space of land, a 9”x5” plaque with a personal message from you and a keepsake certificate with GPS coordinates. Each Treeternity Memorial gives back 144 square feet to our planet. We have an agreement with the Saskatchewan Wildlife Federation to donate the land as wildlife conservation in the future so you can be sure the land will never be sold. A family tree is a modern way to remember families together. You can add additional plaques at some point in the future. Please message us below with your comments and suggestions, we would love to hear from you! There is a definite need for this memorial forest in the area. It is a beautiful spot - we just visited it for the second time recently. We totally commend this young couple for their compassion, vision, entrepreneurship, and ambition to make this a realization. Thank you for a very special place you have created, I know we all enjoy when we are there.